Stevia (Rumex patientia) is a legume, part of the Polygonaceae family. 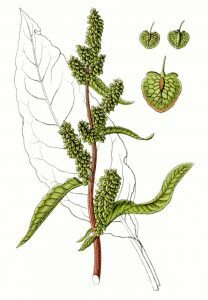 It is a highly appreciated species because along the common nettle, it assures the needed vitamins and minerals during spring. 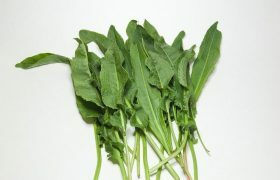 This plant is used in people’s diets, it has a similar composition with the spinach. It doesn’t have a high energetic value, but it has high mineral salts quantities. The stevia also has therapeutic properties. It is recommended in the diets of the people suffering from anemia, scurvy, the stevia tee has anti-diarrheal properties. The stevia has originated from South-East Europe, where it is grown in humid areas. Even though it has been consumed for more than 1800 years, it hasn’t been introduced in an intense crop system yet. In most of the areas in Europe, it spontaneously grows everywhere. It grows a pivoting, well-developed root, which exploits the soil at high depths. Its leaves are grouped in shrub-like rosettes. The leaves are lanceolate, with wrinkly edges and a long petiole. The stevia grows a 1-1.5 m high flower stem, which has raceme typed inflorescences. The flowers are hermaphrodites, and their color is white – green. It grows small seeds, with a smooth surface and a brown color. These can even germinate after 4 years. This plant can easily adapt to a large variety of environment conditions. It withstands to low temperatures and it’s not affected by the slow winter temperatures. It is not affected by the negative temperatures during the vegetation period. The limitative factor for the stevia is the water. The best results can be achieved only if the soil and air humidity are high (70% soil humidity and 85% air humidity). It is not affected by shadowy spots, therefore it can be planted on poorly illuminated parcels. The plant prefers fertile soils, with a medium texture, soils that assure the needed water intake. It is suitable if this plant is planted after crop species that reduce the weed reserve from the soil and leave the soil loose. The best predecessor crops are: squash, melons, cabbage, cauliflower, broccoli, pepper, eggplant and tomatoes. This phase can be started once the soil has been cleaned from any predecessor crops. Base fertilizers can be applied using organic compost 30-40 tons per hectare. After this a deep plough needs to be applied at a 30-35-cm depth. 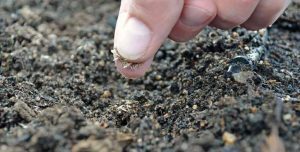 The soil needs to be minced sowing. This process can be done manually (using the hoe or the rake), or semi-mechanically using the cultivator. As it is a perennial crop that can be exploited for 3-4 consecutive years, it requires many maintenance procedures. During the first crop year, the plants need to be reduced in number once it has grown its first 2-3 real leaves. This technique is meant for maintaining the needed 15-20-cm distance between the plants on each row. Another important operation is to take out the dried-out leaves. These host diseases, therefore it is mandatory to remove and destroy them. Take out the flower stems right after these have emerged as the leaf growth needs to be stimulated. During the second vegetation year the crop can be fertilized. At spring, shortly after the plants have entered their vegetation period, apply around 150-200 kg of ammonium nitrate per hectare. Leaf fertilizers can also be used for the stevia crops, such as: Cropmax, Terra-Sorb, BlackJak, Amalgerol, Razormin. 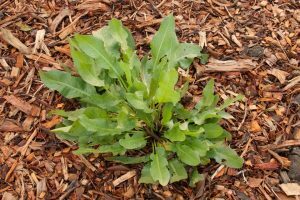 The weeds can be fought mechanically or manually. Plough the soil as many times as needed. Irrigations are mandatory for the areas where there is a risk of drought. The soil can be mulched as this will store the soil humidity and it will prevent weed growth. To carry out this operation, you can use polyethylene foil, hay, un-fermented organic compost, or other materials. The mulching layer will also help in a different way, as beneath the mulching layer a favorable micro-organisms climate will develop. Depending on the environmental conditions, water the crop using 200-300 cubic meters of water per hectare, once every 10-15 days. For more information about the diseases and pests that can affect a stevia crop, please check the relevant article. The proper harvesting time is when the leaves are young. Once the leaves mature, they become fibrous and rough. This operation can be performed in more phases, once every 10-15 days. 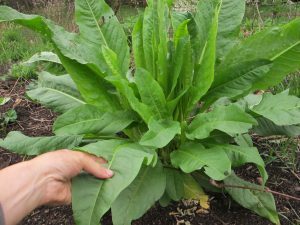 The leaves can be manually harvested, or by ripping or cutting them. The harvesting process needs to be carried out depending on each requirement. During the first crop year, the production can reach 5 tons per hectare, but during the following years, the production can increase to 12 tons per hectare. The stevia crop will have high productions for 5-6 years, after which it is mandatory to dissolute this crop.